On behalf of the Captain and DALMATIA AUREA TRAVEL we would like to welcome you on your Adriatic Cruise. 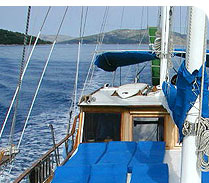 Chartering a gulet give you the chance to enjoy the ultimate Croatian cruising experience: this is a relaxed kind of holiday where you will be expected to do nothing but suit yourself, all aboard a big, beamy vessel with lots of deck space and four or more spacious cabins. Your every need is attended to by your Croatian crew who will endeavour to introduce you to the richness of the Croatian culture. It is essentially a gourmet cruise. Our Company representative will visit the Gulet on Saturday morning to give you information about your cruise. If you have any questions they will be able to answer them for you. After the welcoming meeting the Gulet will set sail on Sunday morning. Gulets normally visit two or three bays daily, making the last stop where we moor for the night. Captain and the crew enjoy passing their experience to guests, often letting them steer or help with the sails. Energetic guests can take advantage of the windsurfing and snorkel onboard or quite simply do nothing but soak up the sun. Once the boat is moored the guests can visit archaeological ruins or explore the beautiful countryside dependable or chosen route and itinerary. Menus will utilise all the local products available including fresh fish, salad and a variety of Dalmatian Cuisine. Meals are on half & full Board basis. Drinks required can be purchased from the bar and paid by Croatian Cash or foreign Cash (Euro). 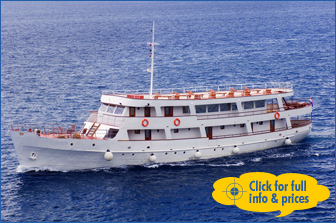 This cruising ship was originally a passenger ship and as such sailed for a considerable number of years in the central Dalmatian coastal region. It has now been reconstructed into a new cruise ship, luxuriously equipped in accordance with all international standards.